as for colours.. I personally don't want a blue board, I'd prefer warm colours. Those are cute shoots Some pictures from this one may work too? They're from this year so slightly more recent. Not sure if you like those ones? I can't get the affiliate site to open, no matter which browser I use, which is weird, because I went to the site all the time before, and right after, it was our affiliate. I tried 3 different browsers, so I can't see which pictures you all have picked. I much prefer she smile, too, in at least not one, if a couple, of her smiling. I like her happy. I definitely don't want anything blue or purple. I do like the pink ones in that swatch, and I like the grayish one at the very right. 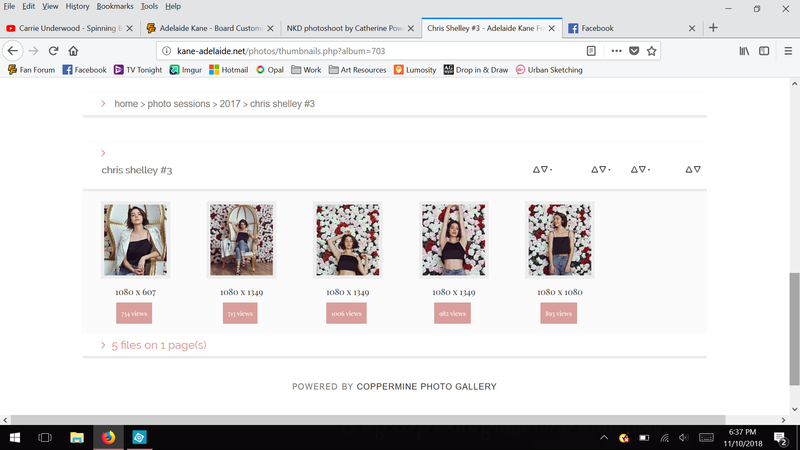 maybe try to clear the cookies.. this might help.. the affiliate it works fine for me..
it's weird specially since the pictures I linked are from a different page than the affiliate..
Maybe try linking to the same sets from the affiliate Holly if the other site isn't working? Is there any other fansite/gallery? no problem Chelle.. and thanks for posting the suggestions.. Thanks for the suggestions. I tried, and it erased all my signed in accounts, facebook, etc. and I had to reload passwords every time I closed my browser. Finally got that fixed, but I am still trying to fix other things in my browser. Tried all those pictures that way, and they still wouldn't load, so I don't know what's up. At any rate, I am not worried about the pictures, but about the color. Certain colors depress me, dark-ish blue, or dark purple. So I'd be a definitely no on those. I like this one, here-the 2nd and 3rd from the left. The pinks with light, warm, colors, would work great for me. Thanks for the suggestions. I tried, and it erased all my signed in accounts, facebook, etc. and I had to reload passwords every time I closed my browser. By gray I mean the very last gray, as a sidebar kind of color. I don't see the gray in the one you posted. The pinks and light purple are the first 3, from left to right. I'd rather not have dark colors, dark blues, or dark purples. I like the ideas of light oranges/tans, with a little green. I don't think I'm explaining well. Maybe Holly can explain what the first 2 light purples, and the pink, that show up for me. Thanks. Good to know. I copied and pasted this, so I can use this next time. Yes! The first 4, from the left. Then the gray at the very end, on the right.